The northwest corner of Oakland County is rural horse country, an area of rolling pastures, whitewashed fences, faded red barns and mares and foals trotting through open meadows. 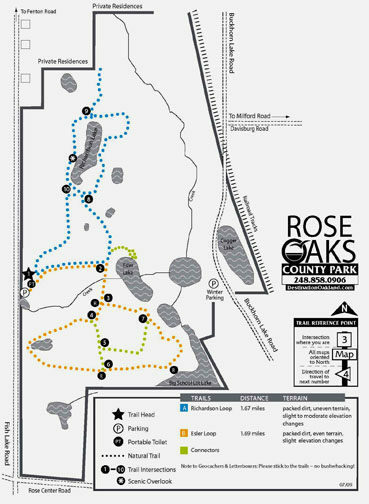 In the middle of it is Rose Oaks County Park, the reason its trail system is open to horseback riding and probably used more by equestrians than hikers. The 637-acre park was purchased by the county 1995 to become its 11th park. Its terrain includes wooded uplands and gently rolling open meadows. But it’s dominated by wetlands and a series of small glacially-created lakes. Almost a third of Rose Oaks, some 200 acres, is marshes and vast cattail swamps that surround two creeks and almost a dozen ponds and lakes. Needless to say, insects can be ferocious here, particularly deer flies in July. 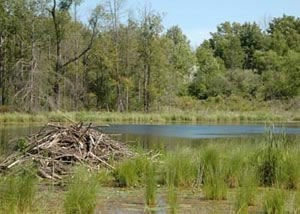 Wildlife includes whitetail deer, waterfowl, a variety of woodland birds and beavers who have set up lodges on the lakes. The park’s trail system totals 4 miles and is a pair loops with the 1.67-mile Richardson Loop skirting its namesake lake to the north and the 1.69-mile Esler Loop in the southern half of the park. Trail surface ranges from old two-tracks and heavily graveled stretches to mowed lanes through open meadows and are well marked with maps at most junctions. Because of the heavy equestrian use some sections will be muddy but overall the trails keep your boots dry despite the wetlands and ponds you’ll be hiking around. Mountain bikers are prohibited from riding on the trails. The most interesting walk is the Richardson Loop where you hike through the oak and maple forests and around the lake, the largest within the park. Hiking Richardson Loop along with a short side trip to Esler Lake is a hair over 2 miles. The perimeter of the entire trail system is a 3.5-mile walk. Two paths depart from the parking lot off of Fish Lake Road. To follow the Richardson Loop in a clockwise direction begin on the one that heads north, nearest to the vault toilet. The two-track trail immediately enters the woods and makes a gradual climb for the most elevation gain of the hike. Within a third of a mile you reach post No. 10 at a junction along a service drive. Head east and with a couple of minutes you’ll reach post No. 8 at a four-way junction. Take the northern fork to the left and soon you’ll be hiking along a low bluff above the west shore of Richardson Lake. Within a few minutes you’ll be at one of two scenic overlooks along the lake. This is the best one in the park as you can sit at a picnic table and gaze down at the length of Richardson Lake. Is that a beaver swimming past you? This scenic portion of the hike ends when the trail swings away the lakeshore and reaches a junction with a service drive 0.6 mile from the start. Avoid the service drive to the west (left) by staying to right at the junction and again at post No. 9, a junction located just a 100 yards down the trail. Soon you’re skirting the north end of the lake, home of a beaver lodge, through an open field where wild blackberries grow. The trail leaves the lake behind as it heads east on a gentle climb through a meadow before returning to the lakeshore within 0.3 mile. The trail continues south along the shoreline to quickly pass another overlook whose the view of Richardson Lake is obscured by brush. Beyond it you swing away from the water and cuts through a marshy area. This stretch can be muddy at times but logs allow you to tip-toe through the area without too much harm to your boots. Within a half mile from post No. 9 or 1.3 miles from the start you return to post No. 8. This time head south to reach a junction in 0.2 mile. To the east is a trail that leads to a spot overlooking Esler Lake, another marshy but scenic body of water that also features a large beaver lodge. It’s less than half mile to hike to the lake and back to the main trail. Continue south on Richardson Loop and in a few minutes you’ll reach post No. 2 where in less than a quarter mile to the west is the parking lot to complete this 2-mile hike. For a longer day head south on the Esler Loop from post No. 2 and in a quarter mile will reach post No. 3. Continue the loop it in a clockwise direction (left) to pass post No. 7 and within a half mile reach a scenic spot with a table overlooking Big School Lake. In another half mile you arrive at post No. 6, marking the junction with a connector trail to the north. The Esler Loop continues east where the, skirts a pond within a third of a mile and then swings to the northeast. From there it’s 0.6 mile back to post No. 2 where 0.2 mile to the west is the parking lot and the end of a 3.5-mile hike in Rose Oaks. Rose Oaks has few facilities other than a parking area, vault toilet and a picnic table at its entrance. Scattered along the trails are a handful of picnic tables while a portion of the paths have been set up as a geocache trailway. The park is open daily from a half hour before sunrise to half hour after sunset. A daily pass or annual Oakland County vehicle permit is required but must be purchased prior to arrival as there no staff at the park. From I-75, depart at exit 93 and head north on Dixie Highway for 2 miles. Turn west (left) on Davisburg Road and follow it through the hamlet of Davisburg. In 7.1 miles turn south (left) on Milford Road where Rose Oaks County Park is signposted and 1.6 miles turn west (right) on Rose Center Road and follow the dirt road for 1.4 miles. Turn north (right) on Fish Lake Road and the posted park entrance will be reached in 0.7 miles. 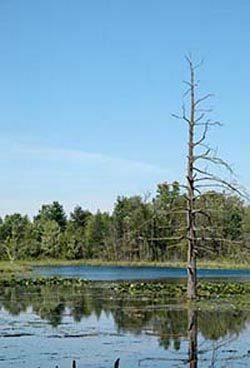 Contact the Oakland County Parks and Recreation office at (248) 858-0906 or online at www.DestinationOakland.com.